In a city that boasts masterpieces such as the Duomo, Sant’Ambrogio and Santa Maria delle Grazie, it is easy to overlook smaller churches—but it would be a shame because you’d miss extraordinary Renaissance chapels, unusual early Christian basiliche and even one of the first trompe l’oeils ever featured in a church. 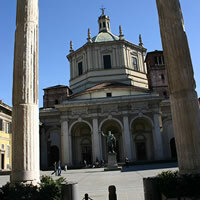 The basilica di Sant’Eustorgio stands on the tomb of the Three Wise Men. The story goes that bishop Eustorgio, who later became a saint, brought the Magi’s remains from Costantinople to Milan on an ox-drawn carriage in the 4th century, and founded a church to shelter them. This sounds somewhat unlikely—chiefly because the basilica that bears Eustorgio’s name was most likely built a hundred years later, in the 5th century. 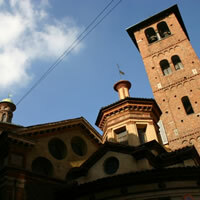 That said, it remains one Milan’s oldest churches and has been at the heart of local Catholicism for centuries. It is here that Duke Ludovico il Moro, Leonardo da Vinci’s patron, met his wife, Beatrice, d’Este; it is here that every new Milanese bishop starts the journey that will take him to his seat; and it is here that, every year, on January 6, ends a procession of the faithfuls to honour the Christmas season. A graceful belltower overlooks the austere neo-Romanesque façade that takes up a side of one of Milan’s prettiest squares. Inside, the huge marble polyptych at the end of the immensely long nave immediately draws the eye, but other treasures are hidden away in the side and back chapels—a tryptich of the Virgin and the Saints by Bergognone, a funeral monument to commemorate medieval Milanese ruler Stefano Visconti, and the exquisitely frescoed Cappella Portinari, one of the greatest examples of Reinaissance architecture in the city, where eight statues support the marble urn containing the relics of San Pietro Martire. The only thing missing (at least in part) are the Magi’s alleged remains—Frederick Barbarossa razed the church and took the holy relics to Koln in 1164. Only a few fragments were returned to Sant’ Eustorgio nearly 800 years later, in 1906. They are now kept in altar of the Magi chapel, by the empty Wise Men sarcophagus. But the Magi’s presence never abandoned the church—in their honour, the bell tower is topped by an eight-pointed star rather than the customary cross. 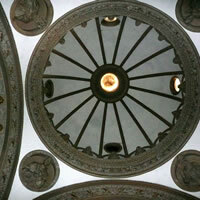 Sant’Eustorgio, in Piazza Sant’Eustorgio 1, Milan, is open Monday to Sunday 8.30am to 12pm, and 3.30pm to 7pm. San Lorenzo shares with Sant’ Eustorgio a late Roman origin and a park, aptly called Parco delle Due Basiliche—but the two churches could not be more different. Where Sant’Eustorgio is clean-lined and austere, San Lorenzo blends a rare early Christian structure with rich late-Renaissance and Baroque elements and a late-19th century façade. One of Milan’s earliest and grandest churches, it was built in the monumental proportions of Roman architecture soon after Emperor Constantine’s edict granted freedom of worship to Christianity and all other creeds across the Empire. Today, it dominates a large square studded with ancient columns, which were taken from a Roman temple and placed in front of the basilica at the time of its construction. Its early Christian layout—four towers clustering around a dome—has miraculously survived to this day despite the many ordeals it went through. Wrecked by several fires in the 11th and 12th centuries, then sacked by Frederick Barbarossa’s troops, San Lorenzo made it through to the 16th century only to have the dome collapse on June 5, 1573. Milan’s bishop, Saint Carlo Borromeo, stepped in and ordered the renovation that would give the church much of its current look, including the huge dome, rising white and gigantic towards the sky, and the 17th century rectories flanking the original edifice. Only the pronaos, with its three arches that bizarrely hide much of the church from view, and the (modern) statue of Constantine were added later—in the late 19th century the former, in the 1930s the latter. Once inside, though, the strong late Renaissance flavour of the exteriors vanishes, and San Lorenzo’s early Christian heritage comes back to life—in the ancient chapel of Sant’Ippolito; in the atmospheric heart of the basilica, a circular core topped by the soaring dome and surrounded by four exedrae; and most of all in the octagonal chapel of Sant’Aquilino, probably an early Christian mausoleum, which has 4th century mosaics and a 3rd century sarcophagus under a Renaissance fresco. San Lorenzo Maggiore, Corso di Porta Ticinese 39, Milan, is open Monday to Saturday, 7.30am-12.30pm, and 14.30am-18.45pm, and from 7.30am to 18.45pm on Sunday. Its foundations were laid around 1476 under the direction of architect Giovanni Antonio Amadeo, but later some of the work was taken over by a young Donato Bramante, who had recently moved to Milan from Urbino. Although there is disagreement among art historians over the exact date Santa Maria was built and the role of each artist, it appears that Bramante was tasked with finding a solution to a space conundrum—a road cutting behind the church meant that there was no room for an apse. The Urbino architect was undeterred: he used the scant yard (97cm) behind the altar to create a stucco trompe l’oeil of a long, majestic apse, complete with columns and arches. Partly thanks to this clever optical illusion, Santa Maria, though small, has a monumental feel, with a grand barrel vaulted nave flanked by two aisles and a majestic dome, possibly inspired by Leon Battista Alberti’s work. But what about San Satiro? The church within the church is a tiny but ancient basilica, founded in the 9th century by Ansperto, archbishop of Milan. It is little more than a chapel and was much ‘improved’ during the Renaissance, when it acquired cotto floors and an extraordinary terracotta sculpture by Agostino de Fondutis, but the Greek-cross plan betrays the earlier origin. Also original, though much more recent, is the Romanesque belfry, which stands guard over San Satiro and emerged unscathed through the Renaissance renovation. Santa Maria presso San Satiro, Via Speronari 3, Milan, is open from Monday to Friday 7.30am-11.30am, and 3.30pm-6.30pm, and Saturday and Sunday from 9.30am to 12pm, and from 3.30pm to 7pm.